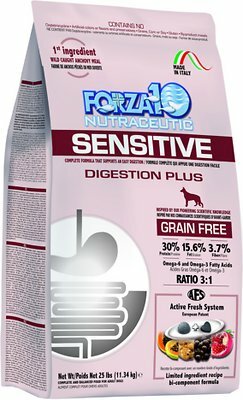 All dogs can benefit from the superior formula of the Forza10 Sensitive Digestion Plus Grain-Free Dry Dog Food. Designed to help dogs with digestive issues, it also offers complete and balanced nutrition for healthy dogs. With wild-caught anchovy meal as the first ingredient, it’s rich with omega-3 and omega-6 fatty acids for a host of health benefits. And since it’s made from raw, uncontaminated materials, you can introduce the food without an adjustment period, and look forward to the speedy relief of symptoms. 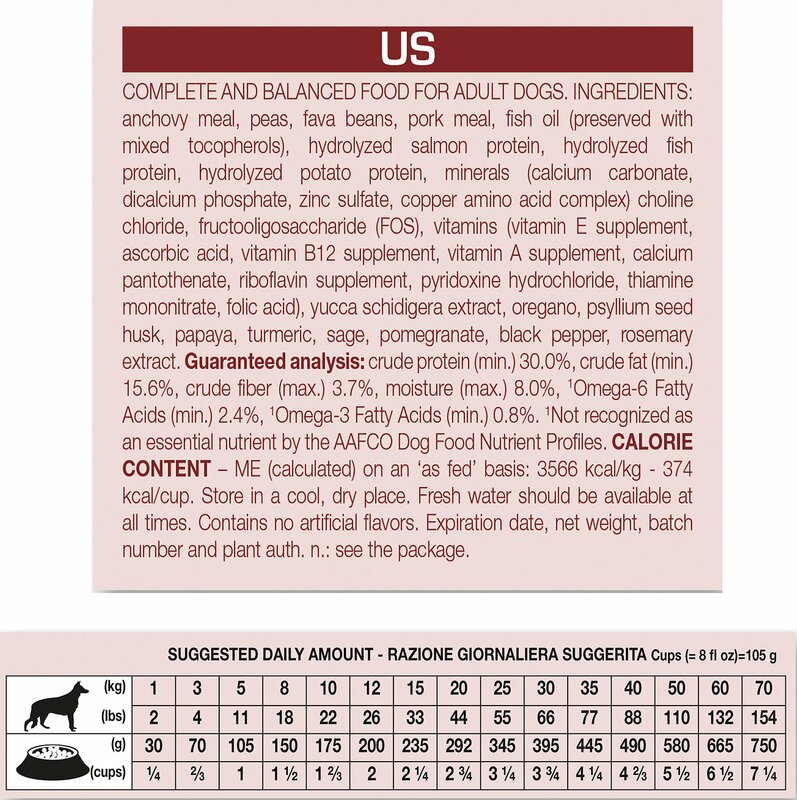 Complete and balanced nutrition for all dogs with wild-caught anchovy meal as the first ingredient. Complete formula to support overall health and specifically gastrointestinal and digestive health. Limited-ingredient recipe is grain-free and rich with omega-3 and omega-6 fatty acids. Developed by a vet with the philosophy of “health through nutrition,” so you can feel good about serving it to your pal. Part of the I.N.P. Integrated Nutritional Program, which offers the most advanced knowledge in animal nutrition. Anchovy Meal, Peas, Fava Beans, Pork Meal, Fish Oil (Preserved With Mixed Tocopherols), Hydrolyzed Salmon Protein, Hydrolyzed Fish Protein, Hydrolyzed Potato Protein, Minerals (Calcium Carbonate, Dicalcium Phosphate, Zinc Sulfate, Copper Amino Acid Complex) Choline Chloride, Fructooligosaccharide (Fos), Vitamins (Vitamin E Supplement, Ascorbic Acid, Vitamin B12 Supplement, Vitamin A Supplement, Calcium Pantothenate, Riboflavin Supplement, Pyridoxine Hydrochloride, Thiamine Mononitrate, Folic Acid), Yucca Schidigera Extract, Oregano, Psyllium Seed Husk, Papaya, Turmeric, Sage, Pomegranate, Black Pepper, Rosemary Extract. When it comes to creating pet foods, Forza10 bases their own nutritional philosophy on scientifically proven nutraceutical ingredients. At the core of their grain-free Sensitive line of dog food formulas is the belief in using nutraceuticals and phytotherapy to provide nutritional solutions for chronic disorders. This means that their foods include ingredients that have been specifically chosen to provide health benefits to pets, especially those suffering from food intolerances. Forza10 strives to create state-of-the-art recipes that will support your pet's health using scientifically supported formulas and ingredients. With more than 25 scientific studies conducted in association with freelance veterinarians, research centers and Italian universities, Forza10 has truly developed recipes that are backed by science and proven to benefit the health of pets. 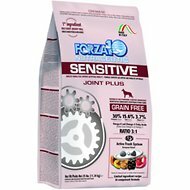 The Forza10 Sensitive line contains six different recipes that are designed to promote the health of various systems within your dog. 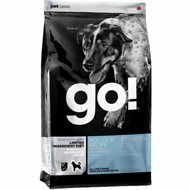 Formulated for dogs with food intolerances that affect their gastrointestinal system. Developed to aid all dogs suffering from food intolerance symptoms that affect their skin and coat. Recommended for all dogs who suffer from chronic or recurrent anxiety problems caused by food intolerance, such as separation anxiety, obsessive paw licking and inappropriate marking. Formulated for dogs who suffer from food intolerances that affect eye health. Developed to help all dogs who are dealing with ear problems as a result of food intolerances. Formulated to offer all dogs a food that protects against common joint issues. The primary proteins used in Forza10's Sensitive line are wild-caught anchovies or herrings, which offer an environmentally sustainable and abundant source of omega-3 fatty acids. They also use 100% Italian pork meal that provides the necessary amounts of saturated fatty acids. To round out their recipes, they add peas and field beans for carbohydrates, plus botanicals selected for their antioxidant, anti-inflammatory, anti-toxic and immuno-modulating capacities. Forza10 was founded by Dr. Sergio Canello, DVM and international expert of foodborne illness. He has dedicated 40 years of his life to researching the true causes of the various inflammatory, chronic and autoimmune diseases that affect the health of dogs and cats. 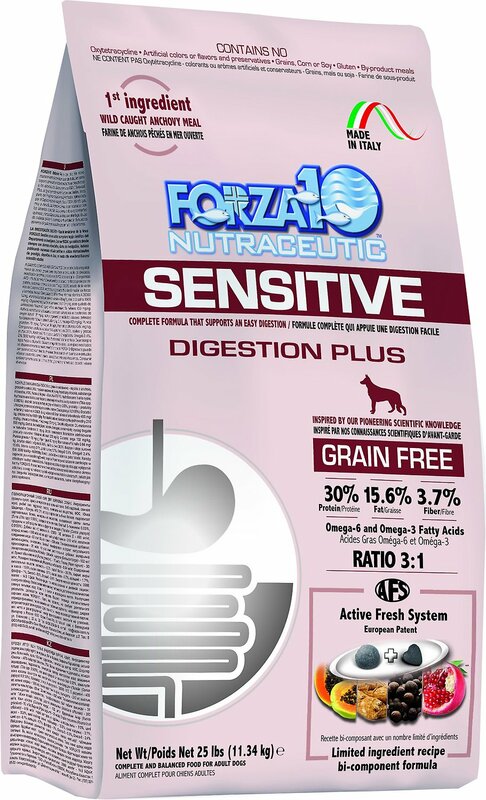 Through extensive research conducted with freelance veterinarians, prestigious research centers and Italian universities, Forza10 has developed pet food that aims to improve your pet's health through the use of nutraceutical ingredients. If your dog is willing to eat this food it could mean the end your tummy troubles for good. I have pets who literally think they are royalty, so of course they won't touch this healthy food, even with many additions to mask the taste. I still wanted them to get the stomach benefits of this food, so I ground this food up with a little wet food and made treats. Thankfully they will munch on theses treats, so it's a good compromise. We tried this food for our standard poodle Riley, a rescue prone to digestive upsets. Half his diet is my home made organic beef and turkey recipe, the other half is a high quality kibble. Within two days on this Forza Sensitive food,along with 1 capsule of Enzymedica Pro-Bio, his belly improved. A week later he has normal stool. His older sister is also doing well on this kibble. I usually do not feed them the same food but I tried her on the Forza and there were no ill effects. I’ve searched for a food to help my little frenchie who suffers with colitis. After spending over 2k in Vet Care, surgery and Rx foods nothing seemed to help. The bloody stool and the pain she was having each time she went potty was just heartbreaking. FINALLY I came across this food and researched the Dr. & let me tell you THIS IS THE BEST food if you have a puppy or dog suffering with Colitis or IBS!!!! After feeding her this food for ONLY two days I’ve seen major improvements in her stool and she’s going potty less and much less blood!!! This food is worth every penny spent!!! I wish I had found this food sooner but so very grateful I found it when I did!!! So far so good, Arnold seems to feel much better very little gas and for the first time in a long time he’s had normal looking bowel movements. Thanks Forza10! Had tried four other dog foods before this one! Finally have solid poop! He loves it too!! My dog had serious digestive issues and was on prescription dog food for years. A friend recommended this as a healthier alternative and its been fantastic! I used to have to order direct from Italy. So happy Chewy is carrying it now! My German Shepherd has a crazy digestive system since birth. I feed him raw for couple years and he had some pancreatic problems. Started Forza 10 he has been a shinning star ever since. Well worth the money. Read up on the food and you will be very pleased. My dachshund was diagnosed with empty stomach syndrome where he would vomit in the middle of the night right before he was fed in the early morning. I didn’t think it could be the food he was on because there were no other symptoms. So we tried some medications and that didn’t help either, so we decided that maybe it was the food. We researched a lot of variations and decided to give this a try! There was no transitioning time between the new food and old food, we just gave this to him cold turkey! From that day, he has not vomited once! So happy to have found this food! Thank you Chewy for carrying it! My dog absolutely loves it!